How to get to Sesame Street? I loved Sesame Street as a kid. My favorite characters were Count, Mr. Snuffleupagus, and Barkley; today I'm partial to Cookie Monster. 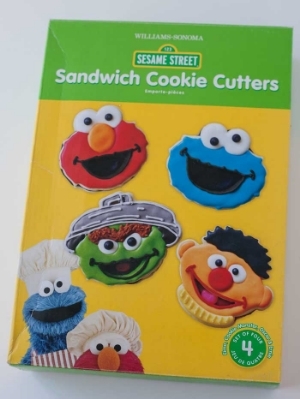 I used the Elmo and Cookie Monster from this set I purchased on clearance a couple years ago at William-Sonoma. You can get the set here, or maybe try Ebay for a cheaper price. I like that the cutters leave an impression in the dough to make it easier to add the icing later. Elmo and Cookie Monster were easy to decorate quickly. I started with filling in their mouths with black icing, followed by filling in the eyes with white. Once both sections were dry, I filled in the blue and red fur. Next I added the black dots to the eyes. The final touch was adding Elmo's orange nose once the red icing had dried. I didn't want to make Oscar or Ernie from this set. Oscar was too complex and how could I make Ernie without Bert? I had to make another character, so I chose Big Bird. I purchased the Big Bird cookie cutter here. Big Bird was more challenging to create. The cutter left an impression, but once flooded with yellow icing, I wasn't able to see the guides. I followed the guides with black icing, then followed with the yellow. With the black lines in place, they allowed me know where to place the eyes and mouth. For the sign, I did not have a cutter. I created the shape in Adobe Illustrator and printed it out. (A feature post on Adobe Illustrator coming later). I made the name "Nolan" out of a royal icing transfer. Royal icing transfers are my new favorite technique and I have a post coming later on using them. I hope this post brings you a sunny day. Today's post was brought to you by the Letters N and C and the number 1.